Disney and Pixar have released the second, official trailer for what what will be their second feature to be released this year. Not waiting for Cars 3 to hit theaters next week, the studio is getting a slight jump on their trilogy capper and while I'm not remotely excited to see a third Cars movie these Coco trailers continue to intrigue. Coco is the one to look forward to this year though, as it offers the first original story from the studio since the one-two punch of Inside Out and The Good Dinosaur in 2015. With this official trailer we are again treated to a clip of the film's protagonist, a young boy named Miguel (voice of Anthony Gonzalez), who we are told is the first living person to ever visit the Land of the Dead. All of this is beautifully rendered in warm colors with tinges of infectious melodies due to Miguel's ancestry and their seeming affinity for music, but the weight of the film seems to still very much rest on what themes the narrative might actually be grappling with. 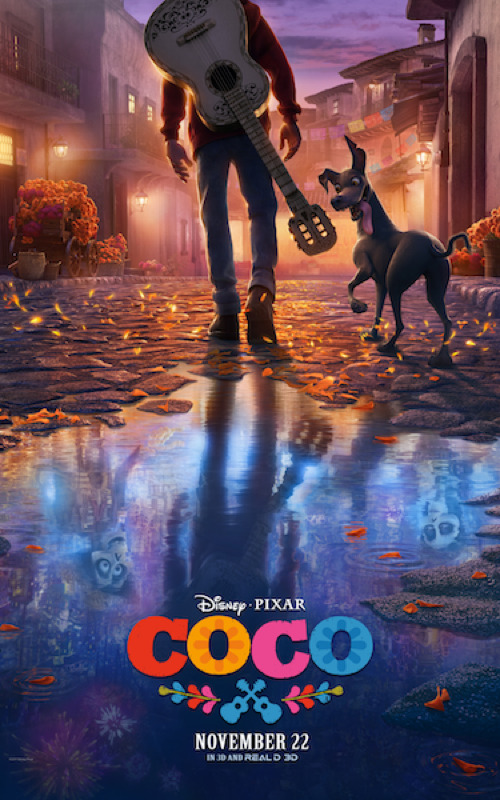 Knowing only that Coco, like 2014's The Book of Life, would in one way or another incorporate Día de Muertos or the Mexican holiday known as the Day of the Dead it might be easy to assume what ideas around death and remembrance that Disney and Pixar might utilize, but I still wasn't sure what to expect. Hinting at ideas of legacy and influence and the amalgamation of what such words can lead to all conveyed through this specific cultural event that honors as much it seems Coco certainly has the potential to be one of those Pixar features that seems to be reaching for more and with the already impressive visuals highlighted here as well as the sense of humor the film will carry I can't wait to see the journey on which the film takes us. Coco also features the voice talents of Gael García Bernal, Benjamin Bratt, Renée Victor, Sofía Espinosa, Luis Valdez, Lombardo Boyar, Edward James Olmos, Gabriel Iglesias, Cheech Marin, Blanca Araceli,and opens on November 22nd, 2017. Synopsis: Despite his family’s baffling generations-old ban on music, Miguel (voice of newcomer Anthony Gonzalez) dreams of becoming an accomplished musician like his idol, Ernesto de la Cruz (voice of Benjamin Bratt). Desperate to prove his talent, Miguel finds himself in the stunning and colorful Land of the Dead following a mysterious chain of events. Along the way, he meets charming trickster Hector (voice of Gael García Bernal), and together, they set off on an extraordinary journey to unlock the real story behind Miguel’s family history. Directed by Lee Unkrich (“Toy Story 3”), co-directed by Adrian Molina (story artist “Monsters University”) and produced by Darla K. Anderson (“Toy Story 3”), Disney•Pixar’s “Coco” opens in U.S. theaters on Nov. 22, 2017.